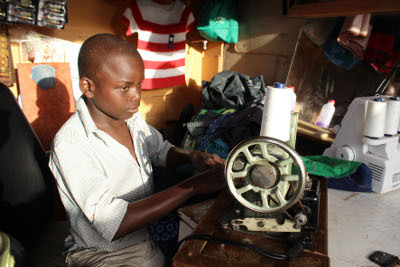 A desire to make money led a Cape Town teenager to start up a sewing business in Du Noon which earns him R300 a day. Wilson Domashe, started up his own business after dropping out of school in Grade 5 in 2011. Operating out of a rented shack in front of an RDP house in the township, his day starts as early as 5am and he only closes shop at 7pm, keeping himself busy sewing African traditional clothing for married women. Domashe’s clientele extends throughout Du Noon and adjacent Doornbach informal settlement. He said with his business earning him about R300 a day he has no plans to go back to school, although his friends, who are now in Grade 7, dream of becoming doctors and engineers. Domashe’s older brother Zex, 24, who owns a tuck shop next to his younger brother’s sewing shop, said he was proud of his younger brother’s business success and together they banked all the profits they made.